Following the success of their fMC event earlier this month, Facebook released two white papers (commissioned by Forrester Research) to empower marketers to approach social more strategically, and which highlight how paid media fuels social momentum. Facebook introduces the white papers by underscoring that 95% of VP and C-level marketers believe we live in a connected world, “where people are connected to the things they care about through social media.” The implications of this for businesses? Traditional, one-way, push marketing is replaced by two-way dialogue (which can be initiated by consumers) and offers the opportunity for brands to connect more authentically with potential and current customers. Perhaps more consequential, it means the veil and tinted glass covering how your company engages in business has been lifted. Much of this change is conceptualized in McKinsey’s Consumer Decision Journey (CDJ). 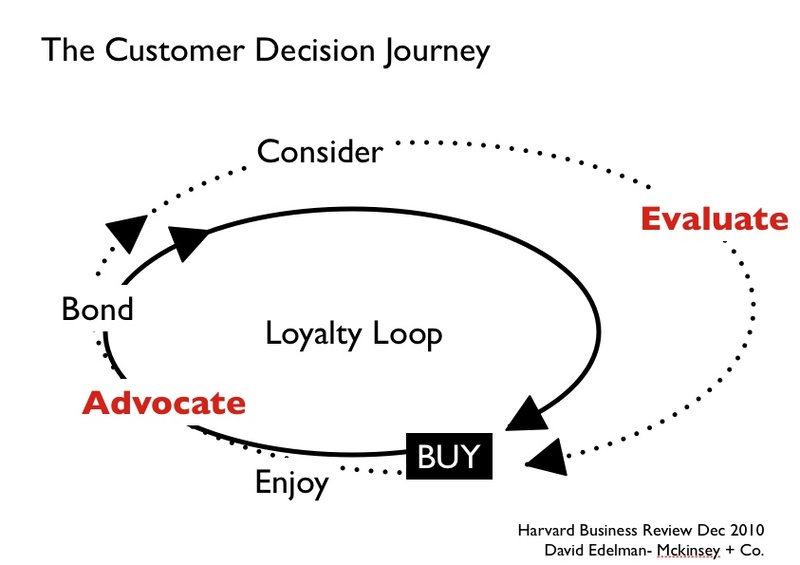 Highlighted before in our presentation to Cornell MBA students, social transforms the traditional marketing funnel (from awareness, through consideration to ultimate purchase) into a loop – where loyalty and engagement are constantly influencing both the purchase decision and loyalty. Measuring the engagement across your owned and earned media is now key to informing paid ad spend. How do you compel people to share your brand’s messages with their friends? How does this engagement influence purchase affinity? Can paid media best be used to amplify this behavior at scale? These are just a few of the questions marketers have, and these white papers help answer. 80% of consumers are more likely to try new things based on friends suggestions and Facebook users are 50% more likely to recall an ad when their friends are featured in it, highlighting how social context in paid media is critical to building social momentum. Retailers enjoyed a 45% lift in orders from social referrals during 2010’s Thanksgiving weekend and Cyber Monday. 59% of marketing executives believe companies that do not fully embrace social as a fundamental part of how they do business will not survive in the future. While 71% of marketing executives believe they can gain a competitive advantage with social, 70% have yet to integrate social into their long-term business strategy. 41% of marketing executives have integrated social media throughout the company, and an additional 40% plan to do so. Looking to make the case for social marketing in your company? Need resources to help you create a game plan? Look no further than these two white papers, packed full of information and a plethora of examples on how leading brands have successfully taken advantage of the social business opportunity.